MENOstage Herbal Menopause Support is one of the products available in the market that helps women before, during and after menopause which is one of the most critical stages in their lives. Unlike other products, MENOstage does not contain any hormones. The company suggests that you take it with their other products such as vitamins and weight loss products. Schizandra Chinensis (from extract) – helps with cardiovascular diseases since it’s one of the major concerns of women experiencing menopause. Hops (from extract) – good for hot flashes and night sweats. Siberian Ginseng Powder – helps with menopause symptoms like insomnia and hot flashes. Atriplex Halimus (from extract) – high in protein, vitamins A, C and D and contains number of minerals such as chromium. Zinc Citrate Powder – taken together with copper, manganese and calcium as bones become brittle during menopause and with aging. The product doesn’t contain any gluten, no wheat, no lactose, no added sugar, no additives and no artificial colorings or yeast. 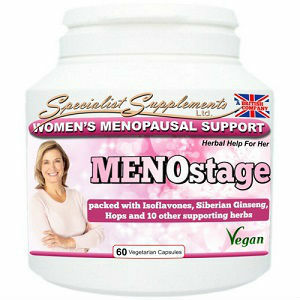 MENOstage Herbal Menopause is good for vegetarians and vegans. You should take one capsule two or three times a day though they recommend a “higher dose” on the first 2-3 weeks. Then the recommended dosage is three capsules a day as maintenance. The product is £12.98 and the company suggests that you take the product with their other products. The product does not provide any money back guarantee. MENOstage may be one of the products in the market that is made of all natural ingredients but also has the “higher” and the “lower” dose. It may be OK for others while it might be a little risky for others. It can also show that the product is not as effective since you have to take more of the product. There are other products in the market that has promised you relief from beginning to end without having to increase dosage. Jackie Horowitz	reviewed MENOstage	on November 11th	 and gave it a rating of 2.